Think As Seen on TV products are a new phenomenon? Think again…As Seen on TV products actually started back in the 1950’s with Ron Popeils, the founder of Ronco, a company still inventing As Seen on TV products today. Some of the first As Seen on TV products were Pocket Fisherman, Minc-O-Matic, Dial-O-Matic, Chop-O-Matic, and Veg-O-Matic, which is now featured in the Smithsonian Institute. Some of these sound familiar, eh? 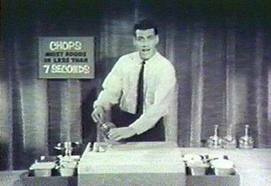 The Chop-O-Matic was brought back to life by Vince Shlomi (aka “the Shamwow guy”) in 2009 with Slap Chop, Slice-O-Matic surfaced in 2011, and Pocket Fisherman can still be found today. For those who scoff at the silly TV commercials late at night and think these products couldn’t possibly do what they say, the popularity of these items over the past 60 years proves otherwise. Besides the fact that these products do some amazing things and make life a little easier and fun, the “pitchman” has played a huge role in the success of As Seen on TV products over time. 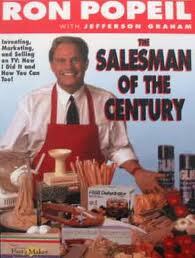 The first pitchman was, of course, Ron Popeils. Born in 1935, Ron came to live with his grandparents after living in foster care from age 4-7 years old. Living with his grandparents proved to be worse than foster care and he was on his own by 16. He eventually reconnected with his father, Samuel Popeil, who was an inventor and sold to Sears, Walgreens, Woolworth’s, and more. Ron helped his father by doing demos in those stores to persuade store owners, managers, and buyers that customers would buy in large quantities. Business was good. Things progressed further for Ron when he was walking down Maxwell St in Chicago and had a thought…” Maxwell Street was a Chicago’s tourist attraction as well as a place to sell all sorts of goods. The first time I went there, the proverbial light bulb went on in my head. I saw all these people selling products, making sales, pocketing money, and my mind went racing. I can do what they’re doing, I thought, but I think I can do it better than they can. Ron seemed to have a knack for sales and was good with people. One of his most successful locations was inside a Woolworth’s in Chicago where he made an astounding $1000 per week, at a time when the average pay was $500 per month. During the summers when he wasn’t working with his father or selling on Maxwell St, he would work the State Fair. This gave him a lot of exposure and taught him how to be a better salesman. He was able to figure out what questions most would ask, as well as objections, and would then build them into his presentations. This turned out to be invaluable information when he started his TV commercials. Ron was at his peak in the mid 50’s, just when TV was on the raise. He saw this as the perfect opportunity to expand his business and provide himself with job security. The first commercial he produced was in Tampa, FL at TV station WFLA. The first product they shot for was made by Ronco called Spray Gun. Spray Gun was a gun-shaped garden hose nozzle with a chamber in the handle for soap, wax, weed killer, fertilizer, or insecticide. The commercial was shot in Florida but aired in Chicago where his products were being sold. It was a huge success and made Ron one of the first people to make millions in this medium. He became the first As Seen on TV Pitchman and continued to sell his own and his father’s products through the 70’s and 80’s. Ron is now happily retired and enjoys fishing with his Pocket Fisherman.